Paczki? Who said Paczki? Paczki Run? Who said run in the middle of winter? Creatively mix the spirit of the paczki with the spirit of Hamtramack and the spirit Tour De Troit can only create a winning combination. 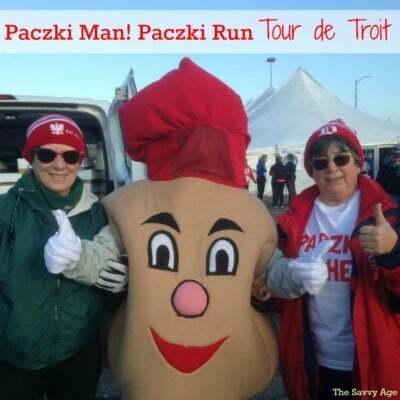 The annual Packzi Run was held on Saturday and intrepid winter runners celebrated the day before Fat Tuesday with a 5k run and finished the run with a paczki plus an optional beer, Polish music and a visit with the Paczki man! The Hamtramack Downtown Development Authority (DDA) benefits from the proceeds of the Paczki Run in support of the DDA’s ‘non-motorized’ transportation plan. Hamtramack is an historic city known for its’ Polish heritage and is also known as Michigan’s Ellis Island. What Is A Paczki ? 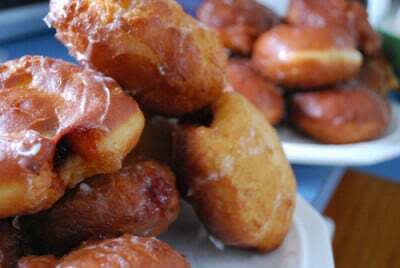 Paczki are pieces of dough which are deep fried then flattened into a sphere and filled with a fruit or sweet filling. Paczki aficionados know it is the dough which differentiates the paczki from its’ cousins due to the richness of the dough. Traditional fillings are powidi which is stewed plum jam and rose hip jam. Popular paczki flavors are blueberry, strawberry, Bavarian cream, custard, raspberry and apple. The paczkis are topped with powdered sugar or icing or zest. Paczkis are traditional Polish fare on Fat Thursday which is the last Thursday priotr to Ash Wednesday. In America, Fat Tuesday is the traditional celebration of the paczki. Fat Tuesday is the Tuesday prior to Ash Wednesday which is the beginning of Lent. Hamtramack, Michigan is the home of the Paczki and celebrates Fat Tuesday as the metro area descends to the local bakeries for their authentic paczki. How Do You Pronounce Paczki? POONCH-KEE is the proper pronunciation. Paczki is actually the plural of the Polish word Paczek. Who Is Tour de Troit? Tour de Troit promotes a healthy lifestyle which incorporates running, cycling and safety. Through education, information, and partnerships with its’ peers in the non profit community and government, Tour de Troit supports the greenway environment. The greenway network promotes non motorized transportation throughout the community. Along with the Paczki Run, Tour de Troit organizes and promotes events such as the Bike The Bridge, Tour de Troit Ride, Martin Luther King, Jr. Memorial Ride, Cycle Into Spring, Run du Nain Rouge Run.